John Grisham delivered not one but two novels this year. While there was some crime and legal shenanigans involved, the first, Camino Island, was more of an excursion for Grisham into the world of writing and writers. 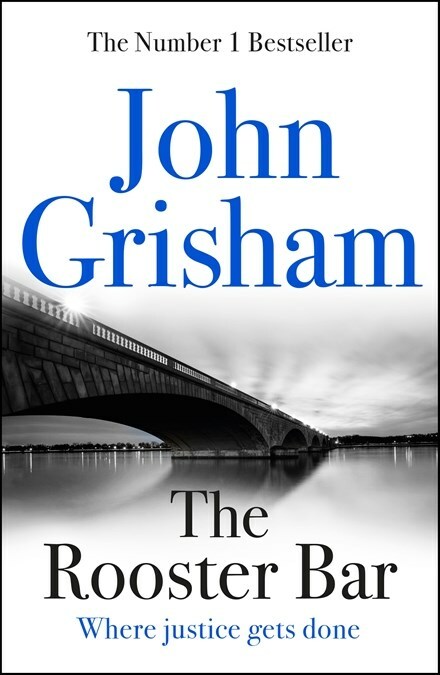 The second, The Rooster Bar, is more in Grisham’s wheelhouse – a thriller of sorts based mainly around the underbelly of legal training and practice. Grisham took his inspiration for The Rooster Bar from an article called the Great Law School Scam. This was an exposé of private universities, set up as diploma factories for law degrees that in the end are not worth the paper they are printed on. The Government lends money to the students which goes straight into the coffers of the law school, the students themselves rack up hundreds of thousands of dollars in debt, get a substandard education and have no career prospects when they graduate. The Rooster Bar is about four such students – Todd, Mark, Gordy and Zola. All are in the last year at the not very prestigious Foggy Bottom Law School in Washington DC and all have debts in excess of two hundred thousand dollars which they will have to start repaying as soon as they graduate. But the four have other things on their minds. Zola and Gordy are sleeping together despite the fact that Gordy is engaged to marry his childhood sweetheart. Then Todd, Mark and Zola have to cope when they find out that Gordy is bipolar, has gone off his medication and is becoming increasingly out of control. As part of his mania, however, Gordy obsessively unearths the links between the owner of their law school (and eight others) and other financial dodgy dealings. After tragedy strikes, Todd and Mark decide on another strategy. They drop out of law school and set up a fake law firm. Together with Zola they trawl the courts looking for desperate clients who are happy to pay cash and rely on the fact that no one will ask to see their practicing licence. The bigger their fake firm gets and the more toes they step on the higher the stakes become. Meanwhile, Zola also has to deal with her family, who had illegally entered the United States twenty six years before, being deported back to Senegal. There is plenty of story here and Grisham is an accomplished story teller. But he has also taken to breaking up this storytelling with long expository sections where he guides the reader through whatever social issue is underpinning the plot. In this case both the financial dirty dealing that is screwing over American law students and the practices of the American immigration service. And while there are thrills here, Grisham often pulls their full punch by telling rather than showing and trusting his reader to go with him. John Grisham is nothing is not reliable. Every year he comes out with a legal thriller that bases its action on a key social issue and the Law School Scam is well worth exposing. His young main characters in The Rooster Bar are engaging and believable even if, in the end, a little smarter and forward thinking than they have any right to be. And while they are pretty much defrauding everyone, including their poor and deluded clients, and are, in many ways, anti heroes, it is hard to not to cheer for them. And that is an achievement in itself.